Many people do not understand what historicism is - simply put, it is the period of Imperial madness not long after the Napoleonic Wars, when artists and architects ran out of ideas and just copied decorative traditions from other cultures and eras, but "bigger and kind of like better you know", not dissimilar from nouveau rich styles of the US or modern Russia. Historicism in the late 19th century was more than the construction of "theme houses" - it was concerned with a certain tradition in fine arts, in the kind of music you would listen to, the way you would furnish your apartment. Historicism was pro-Habsburg, pro-Catholicism, pro-Army, pro-Internationalist, pro-Empire, pro old order. As a lifestyle associated with a certain social group (mainstream decisionmakers), it created the environment, from which the Wiener Moderne (Vienna Modernism) could emerge. 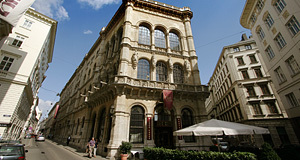 Ironically, one of the most important historicist buildings in the centre of Vienna′s first district, the Palais Ferstel, became a stage for some of Austria′s most important modernist intellectuals. The Palais Ferstel is a building at the Freyung Square. This is symbolically significant, since its main entrance faces the Schottenstift, the ancient Benedictine abbey that was founded by Duke Friedrich Jasomirgott in an attempt to "civilize" this town so that it might become a decent capital at some point. In a way, this is the spiritual birthplace of Vienna as a major city. The Palais Ferstel was built after the revolution of 1848 had been suppressed and Emperor Franz Joseph had started to consolidate his crumbling empire: The property was sold to the k.k. Nationalbank in 1855. By then, the booming economy and the progressing industrialisation had led to a rapid modernisation of Austria′s business and finance world. The national bank wanted to create a building that would accommodate the need for more staff as well as the foundation of trading venues for the stock exchange. The architect Heinrich von Ferstel was one of the establishment′s preferred architects and in charge with many of the representative Ringstraße buildings. He was hired for the job. In the style of the Italian Renaissance, he constructed a building that provided enough space for the national bank, shops and a café. Matching with the landlord′s political ideas, the building was decorated with 12 sculptures - allegories for the nations of the Empire. The interiors of Palais Ferstel were elaborately decorated, with vellum as wall-paper and wooden panels on the ceilings. Heinrich von Ferstel himself gave order to hire a silversmith for the construction of the gates, since he thought they were too delicate for the coarse hands of ordinary locksmiths. Most of the stone that the building is made of, was taken at the quarry of St. Margarethen in the Burgenland - just like the stone of the Stephansdom and many other significant buildings in Vienna. Continue with "Palais Ferstel - Part II"